Applebee’s Neighborhood Grill & Bar will receive a full-sized entree from an exclusive menu on Sunday, Nov. 11. Bar Louie is offering a free flatbread or burger (up to $15) to veterans with proof of service on Sunday, Nov 11. The pub operates in 28 states. Bob Evans restaurants are offering free breakfast, lunch or dinner items on Sunday Nov. 11 for active duty military, retirees and veterans with ID or proof of service. Bonefish Grill is giving active and retired service members a free Bang Bang Shrimp appetizer on Sunday, Nov. 11. A valid military ID is required. Buffalo Wild Wings is offering a free order of traditional or boneless wings and a side of fries to veterans and current members of the military on Sunday Nov. 11. Proof of military service is required. CentraArchy Restaurants, which has New York Prime, California Dreaming, The Tavern at Phipps, Chophouse New Orleans, Carolina Roadhouse, Joey D’s Oak Room, Chophouse ’47 and Café restaurants in Georgia and other Southern states, is offering a free meal for veterans on Sunday, Nov. 11. Call ahead to verify participation. 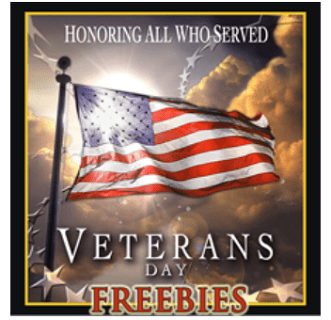 Chicken Salad Chick is offering a free “Chick special” and regular-size drink to any veteran or active-duty military member who visits on Monday, Nov. 12. Chili’s is offering a free meal for veterans at participating locations on Sunday, Nov. 11. Proof of military service is required. Chipotle has a buy one, get one free deal on a burrito, bowl, salad or order of tacos for veterans, retired and active duty military personnel, and military spouses with proof of military service or a valid military ID on Sunday, Nov. 11. The Chop House is offering 50 percent off any dine-in lunch or dinner entree to veterans with a military ID or in uniform on Sunday and Monday, Nov. 11-12. Cicis Pizza will offer a free buffet with proof of active military service on Sunday, Nov. 11. City Barbeque is offering a free sandwich platter to veterans and military members on Sunday, Nov. 11. Proof of military service is required. Cracker Barrel Old Country Storeis giving veterans a choice between a slice of its Double Chocolate Fudge Coca-Cola Cake or one of its crafted coffee beverages on Sunday, Nov. 11. Dunkin’ Donuts is offering a free doughnut to veterans and active duty military personnel at participating restaurants nationwide on Sunday, Nov. 11. Famous Dave’s is offering a free two-meat combo with a choice of side and cornbread muffin to veterans and current military personnel on Sunday and Monday, Nov. 11-12. Proof of military service is required. Call ahead to verify participation. Fatz Southern Kitchen, which has 38 restaurants in the Carolinas, Georgia, Tennessee and Virginia, is giving all veterans and active military a complimentary World Famous Calabash Chicken basket, from 11 a.m. to 11 p.m. on Monday, Nov. 12. The chain is also observing Military Appreciation Month and will give all veterans and active military personnel a 25 percent discount on entrees through Nov. 30. Friendly’s is offering a free breakfast, lunch or dinner to guests with an valid military ID or honorable discharge card on Sunday, Nov. 11. Golden Corral will serve free dinner buffets with a beverage from 5-9 p.m., on Monday, Nov. 12, to any person who is serving or has served in a United States military branch, including the National Guard and Reserves. Identification is not required. 15 percent military discount on food and non-alcoholic beverages any day of the week for military members with valid identification at HMSHost-operated airport and travel plaza locations nationwide. Hooters is offering all veterans and active-duty military personnel with a free entree from a special Veterans Day menu with the purchase of a beverage on Sunday, Nov. 11. Guests must present a military ID or proof of service. Joe’s Crab Shack is offering 20 percent off to veterans and military members with a valid military ID or proof of service on Sunday, Nov. 11. Little Caesars Pizza is offering a free pizza or $5 lunch combinations to all veterans and active military members from 11 a.m-2 p.m. on Nov. 11. Proof of military service is required. Call ahead to verify participation. McCormick & Schmick’s: Vets and Gold Star Honorees (parents and spouses) can get a free lunch or dinner on Nov. 11. Options include Salmon Rigatoni, Tender Beef Medallions, Beer Battered Fish & Chips and more. See the full Veterans Day menu. Mimi’s Cafe is offering a free entree from a special menu to active duty military personnel and veterans all day on Sunday, Nov. 11. The restaurant operates in two dozen states. Olive Garden is offering veterans and active duty military personnel a free entree from a special menu on Sunday, Nov. 11. Proof of military service is required. On the Border: Veterans with a valid military ID or proof of service get a free Create-Your-Own-Combo 2 Meal. Served with Mexican rice and beans, plus endless chips and salsa. Pilot Flying J is offering veterans and active duty military members a free breakfast sandwich, packaged pastry item or Cinnabon Center of the Roll item, along with a free coffee, from Nov. 10-12. To claim the offer, they need to download the myPilot app. The offer is good at the 750 Pilot and Flying J Travel Centers in North America. Red Lobster Seafood Restaurants is offering a free appetizer or dessert to veterans, active-duty military and reservists with a valid military ID on Sunday and Monday, Nov. 11-12. Red Robin is offering its Red’s Tavern Double and Bottomless Steak fries for veterans and active military personnel who show a valid military ID or provide proof of military service on Sunday, Nov. 11. Romano’s Macaroni Grill, which has restaurants in about two dozen states, is offering free Mom’s Ricotta Meatballs and spaghetti entree at all of its U.S. locations on Sunday, Nov. 11. All veterans and active military must present a military ID or proof of service. Ruby Tuesday’s is offering a free appetizer to veterans and active duty military personnel (up to $10) at participating locations on Sunday, Nov. 11. Scooter’s Coffee is offering a free coffee drink of any size to veterans and current military personnel with a valid military ID on Sunday, Nov. 11. Also, stores will be taking donations for Wounded Warriors Family Support on Nov. 11-12. Shane’s Rib Shack restaurants in Georgia are offering a free sandwich combo and a 20-ounce drink to all veterans from Nov. 8-10. Sonny’s BBQ is offering veterans and active duty military personnel a free pulled or sliced pork combo on Monday, Nov. 12. Starbucks is offering veterans and a free 12-ounce coffee to veterans, active duty military personnel and their spouses on Sunday, Nov. 11, with proof of military service. SweetFrog Frozen Yogurt is offering one of its 12-ounce premium frozen yogurt treats to veterans and active duty military personnel who show a valid military ID or proof of service on Sunday, Nov. 11. Tijuana Flats is offering a free entree and fountain drinks to veterans with a valid military ID on Sunday, Nov. 11. The deal includes both dine-in and carry-out meals, but isn’t valid on online orders or those placed through Uber Eats. Gigi’s Cupcakes: Free cupcake Monday for to veterans and first responders. HMSHost: Free Budweiser BBQ Cheddar Burger at participating HMSHost-operated airport restaurants Monday.